It’s raining again. It feels like winter in Vancouver, except it’s spring along the Bay of Fundy. As fate would have it, I’ve been reflecting about the news. Today I’ve read about the elections in Alberta and the rise of the Wildrose Party, a Canadian cabinet minister (Bev Oda) spending a thousands a day on limos and $665 a night at a tony London hotel, and an Ontario teacher railing against her former students for falsely accusing her of abuse. Yesterday, I read that a pact was announced between the United States and Afghanistan to “protect” the war-torn country after the 2014 withdrawal deadline. And I read about American soldiers parading around and posing with the body parts of dead Afghan insurgents. There is so much streaming through the news that we barely have the inclination to follow it all. But what about the major ongoing stories that we should be following? As in, say, Fukushima? A major part of the Fukushima story is the government fumbling, corruption and misinformation following the event, which I won’t get into here. But add to that the alarmist speculation that emerges as a direct result of unclear communications, and one sees a disaster of epic psychological proportions. The story is still complex and unclear. I gather there are still cooling issues at the plant. A full meltdown through the concrete seems to have been averted. Some 1500 tonnes of contaminated water were to be jettisoned into the ocean. Meanwhile, the Japanese government has committed $13 billion to the cleanup, which will include the removal and disposal of 29 million cubic meters of earth from the area, the whole process taking an astonishing 40 years to complete. The Japanese culture has a lot to do with the handling of the crisis. Perseverance, stonewalling, saving face, dignity and honour are old features of their society. These same qualities kept them fighting in World War II long past the possibility of winning, until Truman put a stop to it with the two nuclear bombs. Fukushima has been called, correctly I think, Japan’s third nuclear attack. We, of course, have our own nuclear power station just up the highway. 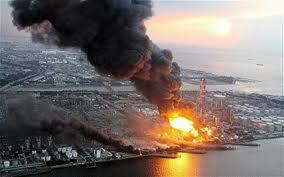 And like Fukushima it is located on a sensitive ocean coast and has had its own safety issues in the past. Without getting into whether our nuke plant is a good or bad idea, I wonder what its existence says about our culture and social values. And just what is our culture? There are two leading cultures out here: the Loyalists and the Acadians. Both are surprisingly enduring and remarkably conservative. Here in southwestern New Brunswick the Loyalists are dominant. Loyalists, by definition, are loyal to the British Crown. For example, the Protestant Loyalists in Ireland supported the British occupation of the island and opposed the formation of an Irish republic, and this opposition led to a sectarian violence that raged for decades. That aside, Loyalist behaviour in general supports the ruling authority, resists change and actively supports long-standing family connections, a governing hierarchy and an unwritten acceptance of a class system. Unlike those rebellious republican neighbours (in Canada’s case to the south), Loyalists do not have a history of embracing truly open, democratic traditions. So why am I telling you all this and what does it have to do with radioactive rain? Because how we govern ourselves affects the very air we breathe and food we eat. Governance is the essence our life’s breath as a society, and a demonstration of our cultural and environmental values. And there’s a local election coming up. So this is timely. I want to talk to you new candidates. And you voters who should care. Candidates, no matter what ideas you may have going in, understand that cultures are self-replicating. The facts prove it. Even when entire management teams are replaced at a stroke, corporate culture is often left totally unaffected. Organizations have a memory and recidivism beyond any of the individuals involved. What does that mean to you as a candidate? That there are three parts to your new job: insight, oversight and foresight. And that for too long in this part of the world, punishing oversight has been the main feature of government, and an abiding loyalty to the interests of the wealthy (for if they don’t do well, we may well lose our jobs and tax base, so the instinctive thinking goes). Here’s my message to all candidates. As the old saying goes, you are only as good as the poorest among us. If you can get that straight and build a better community for them, with insight and foresight, you might have something to offer the rest of us who vote. Otherwise, you’re just more of the same old, same old, working for The Man. If we look and listen carefully, we might all build something more than a pretense of democracy.